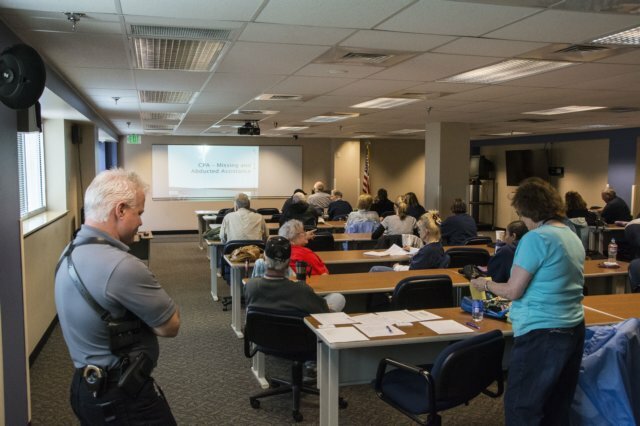 Volunteers role-play assigned scenarios designed to give the officers almost real-life situations in which to train. In addition to serving as actors, our volunteers sometimes "loan” their homes and businesses to the SWAT team for more realistic situations. Trained volunteers are on-call 24/7 for this activity, which requires training and ongoing refresher courses. There are two segments to CMART: tipline and field search. The tipline response team will be activated when information on missing children is published in the media with a number to call for those who have information on the missing child. Volunteers will man phones, take reports, and turn information over to Officers for follow-up. The field search response team will respond to a specific location and help with the active search for the missing child. Volunteers assist officers at approximately six DUI checkpoints each summer. Volunteers track the number of cars passing through the checkpoint, the time it takes to go from beginning to end, weather conditions, and other data. Volunteers also assist with recording road-side sobriety tests. Volunteers are typically on the street from 9:00 p.m. to 3:00 a.m.
Visit our Volunteer page to see all the ways you can help us through the ACPAAA.